Have you ever wondered about the value of old pennies mixed in with your spare change? Or perhaps, you have an old jar of coins given to you from an older relative or you may have received several old pennies in your change at the grocery store. Each day many of us hold pennies in our hands as we wonder if there is one that is of value. When you think of old pennies, do you think of pennies designed with the Lincoln Memorial, or older Wheat or Indian Head pennies? These are the types of pennies that come to mind when most people think about old pennies. Pennies of this type are examples of small cents. For 64 years before the small cents were minted, the United States Federal Government struck penny coins known as large cents. Large cent coins are made of copper and are about the same size of a current $1 coin. The first large penny coin was struck for only one year, 1793. The coins' design is known as the Flowing Hair Chain. It was the first circulating coin minted by the United States Mint making any of the surviving coins of the 36,103 coins struck highly valued by collectors. Average prices range from several thousand dollars for coins in poor condition to more than $500,000 for coins that are well preserved. On January 5, 2009, a record was set when a Strawberry Leaf 1793, NC-3, Rarity-8 large cent sold at Stack's Auction for $862,500. The coin certified by PCGS is very rare and is one of the four known coins of its type still in existence. Naturally, these old copper large cents are not being handed out at the local supermarket when you get your change. However, there may be one tucked away in Grandma's jewelry box or Uncle Joe's old jar of coins. The following are excellent resources for finding the value of these early American one cent pieces. During the last 153 years the United States penny has been struck as a small coin made of a combination of metals. In 1856 the United States Mint in Philadelphia struck the first of the small one cent pieces called the Flying Eagle. The mint struck approximately 1400 coins that were intended as pattern pieces. The coins were not intended for release to the public. After being shown to certain members of the Senate and Congress the coins were to be returned to the mint and destroyed. However, not all of the coins were returned and those that were not destroyed are extremely valuable today. Depending on the condition, these old pennies are valued from $6,700-$150,000. Flying Eagle one cent coins were minted for release in 1857-1858 and are made of copper and nickel. 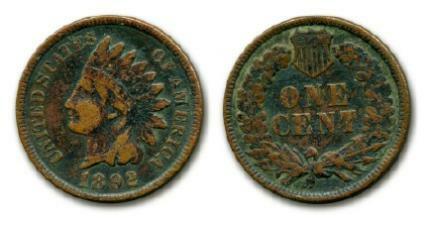 Minted from 1859-1909, the Indian Head penny is a design of Lady Liberty wearing a headdress of feathers. Mistakenly many people believe the design depicts an American Indian wearing an Indian chief headdress or war bonnet. The value of Indian Head pennies, like all coins, depends on their condition and rarity. The composition of Indian Head pennies also affects the value of a specific coin. Coins struck from 1859-1864 were made of copper and nickel and later coins were a combination of copper, tin and zinc. Hobbizine provides a chart with approximate values of Indian Head pennies. The first Lincoln pennies were struck in 1909 and have undergone several major changes over the years. Although many old Lincoln pennies are only worth one cent, there are also a great number of them that are valued at more than face value and others that are rare pennies. The following are several examples of old penny values. These values are for collectible coins that are in good condition. The next time you have a pocketful of change, remember the value of old pennies could make the change in your pocket worth more than you think. .